Literature – find out who wrote Darkness at Noon or what was Daniel Defoe’s last major work of fiction? Kaleidoscope – take pot luck and get questioned on anything from where did coleslaw originate, through to what was the name of the father of Zeus? History – delve into the depths of time and answer questions on numerous topics including the Inca Empire and World War 1. Sport – do you know who invented volleyball or what is the height of the wicket in cricket? Science – answer questions on crucial scientific developments and discoveries that have shaped our world. Geography – do you know where the world’s tallest tree is located or which explorer discovered the Victoria Falls? Quiz – select your subject, level and type of quiz. Watch the video clips as you try to answer the questions. Compete against the world’s greatest source of knowledge! The quest for knowledge is an ongoing process. One of the most exciting and popular methods of acquiring knowledge is through quizzing. The Editors of Encyclopædia Britannica now bring to quiz fans, a unique CD-ROM derived from the world’s greatest source of knowledge Encyclopedia Britannica. This interactive PC CD-ROM is a compilation of more than 2,800 questions and answers, with each answer providing you with an explanation of the subject of the related question. 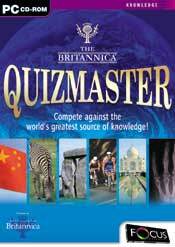 The Britannica Quizmaster PC CD-ROM gives you a choice of playing the quiz the way you want to. Covering a wide range of specialist subjects including Geography, History, Literature, Science, and Sports – you can choose your favourite subject, time your quiz, and know your score. So whether you are compiling a quiz for yourself or looking for a way to amuse yourself, family or friends, there is sure to be something on this PC CD-ROM to challenge your mind.